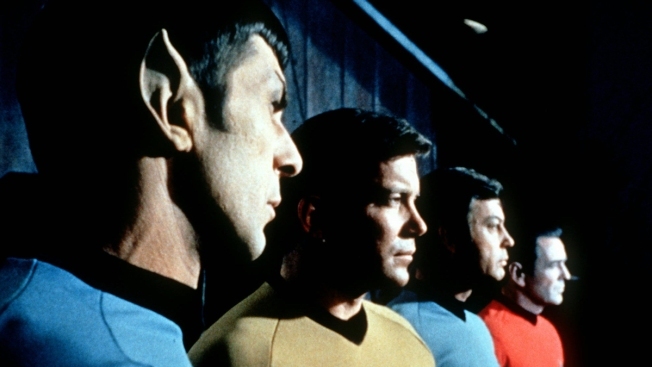 Actors in the TV series "Star Trek," from left, Leonard Nimoy as Commander Spock, William Shatner as Captain Kirk, DeForest Kelley as Doctor McCoy and James Doohan as Commander Scott. James Comisar says 400 items from his collection will be for sale. That includes the Riddler's green jacket from the first episode of "Batman" and a protective glass "bat shield" from the camp 1960s series. More than 50 lots of "Star Trek" costumes, sketches, jewelry and correspondence acquired from series costume designer William Ware Theiss will be part of the sale. Prop Store, a film and TV memorabilia company, is hosting the auction on Dec. 1 at its Southern California facility. Items can be viewed online and bids can be placed on auction day by phone or on the Prop Store website.